We had a busy summer and missed reviewing IDLES‘ second album. Happily, we have new writer Gareth O’Malley stepping in and rectifying the situation. His words follow. >Bristol-based punks IDLES could have been forgiven for taking some time off after they finished touring ‘Brutalism’, their incendiary debut album, but the quintet had other ideas. Chief among them was heading right back into the studio and putting together its successor. That ‘Joy as an Act of Resistance’ came together as quickly as it did shouldn’t be surprising, given how the band have become known for throwing themselves into a tough tour schedule in recent years. They’ve made up for lost time – no more 3-year gaps between releases like what happened with their 2012 debut EP ‘Welcome’ and its 2015 follow-up ‘Meat’ – and have no plans to slow down any time soon. That sense of urgency is also a key part of their sound: up-tempo, riff-heavy material matched in its intensity by firebrand frontman Joe Talbot’s emotional lyrical bent, delivered in a full-throated roar. There’s little room to breathe across this LP’s 12 tracks. Though the record is by turns both personal and political, it’s pretty full-on throughout. Even its softest song, ‘June’, is a heartbreaking eulogy for Talbot’s stillborn child, an unflinching look at an episode of personal devastation and grief. Among the many topics it tackles are mental health, xenophobia, violence, classism and above all, self-acceptance. “If someone talked to you the way you do to you / I’d put their teeth through / Love yourself!” Talbot yells encouragingly on ‘Television’, a song that shouts down unrealistic beauty standards and the effect they can have on self-esteem. That track pairs well with the ferocious ‘Samaritans’, whose own message of self-love is delivered as a call for men to cast aside the mask of masculinity worn by previous generations (“This is why you never see your father cry”) and express their emotions instead of bottling everything up. Driven by a powerhouse performance from drummer Jon Beavis, it’s a rallying cry for a society – and the music industry – blighted by a rise in male suicides. Fighting to end the stigma around mental health issues, the band also contribute their take on American preacher and soul singer Solomon Burke’s ‘Cry to Me’ as the record’s penultimate track. The justice they do to it, you’d think it’s an IDLES original unless told otherwise. It allows the listener some downtime before the band bring the album to a clattering halt with the anarchic ‘Rottweiler’, a growler of a track that predates even ‘Brutalism’ but makes an ideal closing track. They certainly know how to bookend their albums; in terms of sheer energy, ‘Rottweiler’ is matched, perhaps even bettered by the two-part cinematic opener and obvious live favourite ‘Colossus’, which builds steadily over 3 minutes before coming to a halt. This is the calm before Beavis counts the band back in, the song erupting into a chaotic shout-along with some of the album’s most quotable lyrics. All together now: “I’m like Stone Cold Steve Austin / I put homophobes in coffins / I’m like Fred Astaire / I dance like I don’t ca-yerrrrre” (emphasis theirs, not ours). Combined with the cathartic heaviness of ‘Never Fight a Man With a Perm’, these two tracks generate enough energy to power a mid-sized town. Elsewhere, the band extol the virtues of immigrant workers and c-o-m-m-u-n-i-t-y on ‘Danny Nedelko’,named for the frontman of Bristolian buds Heavy Lungs, whom have since returned the favour), blast Brexiteers on ‘Great’ and take themselves down a peg while simultaneously lampooning those who might take issue with their left-leaning politics on the self-effacing ‘I’m Scum’. Even ‘Love Song’ takes the age-old view of romance and turns it on its head with a dose of white-knuckle noise rock. Across the 42 minutes of ‘Joy as an Act of Resistance’, a lot of ground is covered, and you might need time to take it all in afterward. But you’ll be glad you did because it is, hands down, the most vital rock record of the year. You might have missed out on ‘Brutalism’, but don’t miss out on this one. Bristol punks IDLES’ sophomore album ‘Joy as an Act of Resistance’ is out now on Partisan Records. For more of our articles here on TGTF on IDLES, follow this link. 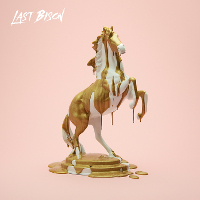 American folk rock band The Last Bison have undertaken some significant changes since we last heard from them back in 2015. Perhaps most obviously, the band’s lineup has slimmed down from five members to three, with the departures of founding members Dan Hardesty and Annah Housworth following the band’s third album ‘VA’ (pronounced as “Virginia”, the state the band hails from). Now comprised of Ben Hardesty (vocals, guitar, percussion), Amos Housworth (cello, bass), and Andrew Benfante (keys, organ, guitar), The Last Bison have been forced to rethink their musical palette, but rather than streamlining, the resulting transformation feels more like a complete and deliberate redefinition of the band’s signature sound. From the opening track of new album ‘SÜDA’, it’s clear that The Last Bison is no longer the organic alt-folk collective we once knew. ‘By My Side’ is a slow prelude to the album proper, but its cool synthetic haze, whispered vocals, and distorted guitars are already a major change from the band’s previously warm, folk-flavoured acoustic rock. Synths, bass, and percussion continue to dominate the musical arrangements throughout the album, beginning with ‘Cold Night’, where frontman Hardesty sings, perhaps ironically and perhaps not, of a past warmth (“comfort like a mother’s hold / the words she spoke set all our hearts aglow”) contrasting with a colder, harsher present reality. However, from this point forward, the thematic references become more obscure and the lyrics more heavily dependent on well-worn metaphors. ‘Blood’ is dark and dramatic, with cello and piano ornamentation adding a touch of light behind the shadowy synth backdrop. In fact, these instrumental moments are more memorable than the song’s awkward refrain: “there you were like a thief in the night / unexpectedly arriving to steal / with my heart on the line / blood was pumping to a wound that had healed / I was yours for a time / for a moment there, you taught me to feel”. The album’s title track, an bright yet introspective ballad, comes midway through the track sequence, but doesn’t do much to clarify the album’s musical intent with its mild ’80s rock sound and its head-scratcher of a refrain: “splitting apart my head / sewing it up with Dixieland”. In the second half of the tracklisting, a variety of rhythmic devices saves ‘SÜDA’ from capitulating to the increasing banality of its lyrics. ‘Anywhere You Go’ has an almost jazzy, r&b kind of feel to its smooth synth melodies and elastic bassline, while ‘The Glow’ and ‘Echo of Eden’ rely on prominent percussion and tribal rhythms to make their emotional mark. One of the strongest tracks on the album, ‘The Glow’ is slow and seductive, its serpentine motion punctuated by a strongly rhythmic backing chorus. ‘Echo of Eden’ is slightly less effective in its overarching social statement, with lyrics ultimately too vague to be very meaningful. Though the rhythmic and instrumental variety on ‘SÜDA’ is interesting, the album overall feels a bit indecisive in its lyrics and its stylistic leanings. The Last Bison’s recent lineup changes have had a tangible impact on the band’s musical choices, some of which were undoubtedly made out of necessity. The synth heavy musical arrangements here are experimental and occasionally inspired, but not enough so to cover for the lyrical weaknesses, especially late in the tracklisting. However, ‘SÜDA’ is nonetheless a brave and earnest attempt to forge a new musical style from an admittedly more limited toolbox of sounds. Venturing away from their former folk rock comfort zone, Ben Hardesty and his colleagues may seem a bit aimless at the moment, but ‘SÜDA’ provides them with several promising departure points for a possible next attempt. The Last Bison’s fourth studio album ‘SÜDA’ is due for release on this Friday, the 21st of September, on AntiFragile Records. You can read through TGTF’s past coverage of The Last Bison by clicking here. The path to creation is often as important as the end product itself. In the case of Knightstown’s debut album, the songs that made it on to the record were part of an arduous 3-year songwriting process for Michael Aston. Classically trained at Oxford and the Royal Conservatoire of Scotland in Glasgow, ‘Knightstown’ represents Aston’s most ambitious effort to date as an indie electronic artist since completing his studies. It follows EP ‘Keep’, which was unveiled in the first quarter of 2018. Interestingly, although violin was the first instrument he picked up as a child, Aston’s primary instrument of choice is keyboards. This fact has already led to some inevitable but favourable comparisons to established acts like South London producer Sampha and the Mercury Prize-winning James Blake, comparisons Aston himself has welcomed. The album smartly begins in familiar territory, with previously released single ‘First Cry’. In this track that’s just shy of 5 minutes in length, there’s plenty of time for Aston to set the tone for the rest of the record. With ‘First Cry’, he’s created a dreamy atmosphere, with his light-as-air falsetto, melodic instrumentation that never overpowers, and a compelling mechanical beat. This lovely, gentle dreaminess continues on ‘Moon’ and ‘Two Appear’, the latter of which closes the album with an additional soulful edge. For those looking for something a bit more lively, ‘Charlatan’ is a standout, Aston upping the tempo with a staccatoing background synth melody and crunchy beats. On the super catchy, programmed beat-driven ‘Bitter End’, Aston sings, “save your tears for a stormy night”. Whether you choose to bop your head or golf-clap your hands to the rhythm, it’s definitely an earworm. Speaking of handclaps, there’s some in another previously released single, ‘Catcher’. Its cheerful tempo makes it feel like an electronic soft-shoe. To let us know he hasn’t forgotten his classical roots, Aston has utilised lush instrumentation on a few tracks here to make us feel like we’re in the presence of an orchestra. Remembering that he’s a solo artist, this is quite the feat. On ‘Eyes Open Wide’, Aston’s voice bounces in the verses, then soars with the uplifting nuances of the arrangement. The frenetic synth notes on another album standout, ‘Come Home to Me’, take us on a ride into space, up high into the heavens. The song’s strings, however, remind us of the tune’s humanity, our debt to Aston’s musical training and of the ability of instrumentals to elicit emotion. Some songs on Knightstown’s debut album demonstrate Aston’s ability to write gentle, atmospheric electronic dream pop. Others suggest his willingness to go in a dancier, more pop-orientated direction. Which way he chooses to go from here, we’ll definitely be listening. Self-titled debut album ‘Knightstown’ is out now on FatCat Records. I interviewed Michael Aston at The Great Escape 2018 in Brighton in May; check out the interview from this link. All our past coverage on TGTF on his solo project Knightstown is through here. Melbourne, Australia’s Benji Lewis now calls Los Angeles home. No matter where the electronic artist hangs his hat, I think it’s safe to say that his newest EP ‘Together Apart’ feels like it was created in the big city whilst contemplating lost love and looking forlornly out over the nighttime skyline. Even at its short length of less than 15 minutes in total, this record exhibits a special kind of emotional grace, through its delicate, minimalist electronic instrumentation and Lewis’ disarming vocals. The EP was produced by Brisbane’s Golden Vessel, who I caught live at BIGSOUND 2017 this time last year. As the title of the record suggests, this is a collection of songs that examine the highs and lows of relationships. Beguiling beats drive the poppiest track here, ‘Us Again’, on which Lewis wistfully recalls a lost love and his journey back to return to that place of bliss. The EP’s standout is the downtempo ‘Came Back’ that continues the story. ‘I came back to you, I’m here, won’t go”, sings Lewis in a peerless falsetto. The instrumentation is sparse with programmed beats and a simple synth melody, and the feel of Lewis’ vocals is reminiscent of fellow Aussie Darren Hayes’ own in his Savage Garden days, but without the ‘90s schmaltz. Moving into ‘Deep Blue’, Lewis goes into more soulful territory, almost Glass Animals-esque with falsetto and twinkly synths but without the fanciful storylines. His words feel less like lyrics and more like a sensual poem set to music: “Touch is right / Skin to skin / We all want, felt within / Tides are high / Further sure / Deep blue, with you”. Incredibly, it’s only been 10 minutes or so, and we’re already at the end of the EP with ‘Push’. The lyrics suggest conflict between our lovers but should you choose to focus on the sweeping vocals and dreamy melody, you sense there’s more than a glimmer of positivity for these two. Yes, life isn’t always perfect, but optimism in our difficult world is more than welcome. Describing the record, Lewis says, “…here are some different stories of love, strength, moving on and also appreciating who is around. Also sneaky moments of hope for new love and what it can be like.” ‘Together Apart’ as a whole is a chill, blissed-out set of songs, leaving you wanting more and hoping that a debut album from the Aussie is just around the bend. ‘Together Apart’, Aussie Benji Lewis’ new EP, is out now. You can stream the entire release below. To read my review of his official SXSW 2018 performance at St. David’s Historic Sanctuary, which described to Run the Trap as “a stand out favourite” and “Everything about that night, loved it.”, go here. “Push the spikes in deep / the pain is going to set you free!” Thomas Sanders declares on Teleman single ‘Cactus’, released back in May. It’s a pronouncement that also stands as a neat summation of the Teleman story so far. It’s an ongoing saga where the connected topics of love and lust, along with loneliness, escapism and depression, are given conveyed in vivid, unusual wordplay against a bouncy, synth- and drumbeat-led backdrop. Now at album #3, Teleman’s wonky, oddly catchy tunes should no longer be a surprise but an expectation to be fulfilled at first listen. Produced by Boxed In’s Oli Bayston, their Moshi Moshi labelmate, ‘Family of Aliens’ follows in the heady footsteps of 2014’s ‘Breakfast’ and 2016’s ‘Brilliant Sanity’. It manages to add another wigged-out, yet enjoyable chapter to Teleman’s musical history. Early taster single ‘Submarine Life’ went old school, utilising ‘80s style vocoder, making everyone think that the third Teleman album was going to sound robotic, at least initially. Turns out they were just teasing us. Phew. The new LP is front-loaded with two other early previews, placed well for maximum pop dancing possibilities. ‘Cactus’ delves into the world of the pretty people, those that put themselves on a pedestal of no fixed meaning or influence. In reality, they’re in their own little bubble and can’t relate to anyone else, which is their true tragedy. Sanders asks rhetorically, “What’s the point of looking good if no-one ever gets near you?” It’s a bit of a warning to young people, that what material and physical occupations consume them in youth turn out to be devoid of substance by the time you’re older. The band spends a good minute and a half on an instrumental jam to close out the song, providing more than ample opportunity for us watching them at the Great Escape 2018 to cut shapes at the Paginini Ballroom. Buoyed by a sweet and springy rhythm and ‘80s feel good synth chords, ‘Song for a Seagull’ pulls things back from the shadowy dance floor. Sanders sings of a different kind of but equally tragic character: like in the Beatles’ ‘I Saw Her Standing There’, the girl across the room you’ve fallen for but in this case, she’s mentally miles away and there’s no way to get through to her. A seagull flying high above the sea might not be the greatest parallel to a human woman on earth. It certainly captures the idea of escaping to a better, beautiful place where you’re unable to be touched or hurt, though (“it’s not hard to see how someone you love is going to mess you up”). For the fans, there are nods to ‘Brilliant Sanity’ in here, from “a little bell that rings” from ‘English Architecture’ (signaling something magical has happened, like falling in love) and a guitar note progression in the outro bearing resemblance to that which closes out ‘Fall in Time’. Contrast ‘…Seagull’ to the chaotic machinations of ‘Twisted Heart’, exploring “the feeling twisted in a world so straight”, of feeling like a square peg in a round-hole world. Not fitting in is a recurrent theme in on this album: whether it’s given a frenetic treatment on title track ‘Family of Aliens’ or a gentler one on ‘Always Dreaming’, the topic is handled with empathy by Sanders. On ‘Fun Destruction’ and ‘Sea of Wine’, reliance on alcohol is given much consideration, described by Sanders in the preview material I was given as “our English way of using alcohol to deal with problems, lose inhibitions, meet lovers”. With alcoholism comes losing touch and at its worst, self-loathing and the realisation that something’s going terribly wrong. A synth wail joins the chaos on the former, while on the latter, ‘Sea of Wine’ floats away in a piano- and beat-driven reverie befitting our fast-paced lives. A potentially overlooked song for its comparative simplicity instrumentally is ‘Between the Rain’. The jaunty piano backing is less important than Sanders’ storytelling: partnering with someone who isn’t fazed by anything leads to your own anxiety coming roaring to the forefront like a sore thumb. Initial exasperation (“I can tell myself it’s a plastic heart / impossible to break it / melt it down!”) eventually leads to appreciation for the peace and maybe even acceptance? Whether it’s this song or another or several others in the collection, it isn’t hard to find yourself in here. Joyously quotable and easily accessible, ‘Family of Aliens’ might just be Teleman’s most mainstream popular album yet. ‘Family of Aliens’, the third album from London-based Teleman, is out tomorrow, Friday, the 7th of September on Moshi Moshi Records. The band are on tour in the UK in September and October; tickets are on sale now except for the sold-out at Bristol Thekla on the 27th of September and Leeds Brudenell Social Club on the 4th of October. Want to flip through our past coverage on Teleman here on TGTF? Come through. A 2-year hiatus for the Bridlington duo Seafret will come to an end with the release of a new four-track EP this Friday. ‘Monsters’ shows a rawer side to Jack Sedman and Harry Draper that was hinted at on their 2016 debut album ‘Tell Me It’s Real’ but was not fully disclosed then. The EP opens with the title track, which instantly sets a moody and mysterious vibe, created through the use of minor chromatic guitar descents, leaving you unsure of what is to come. This moodiness becomes even more dramatic with the addition of low stabs on the piano that reverberate under the vocals and guitar. It’s a successful theatrical opening to the record, creating suspense in subtle and clever ways and avoiding becoming gimmicky. The pace picks up with second track ‘Can’t Look Away’ which starts acoustically and gently, but then goes on to explode into an electric chorus, heavy with accented drumbeats and sustained guitar twangs. The song is powerful and a great contrast to the previous track, but something feels missing. By the end of the tune, the verses and choruses are over-repeated and even with the stripped-back bridge that offers some respite, there is not enough variation or climatic tension to really elevate the song. It’s a slight let down when compared to an EP that has so much emotion and raw edge to it. One has to ask, have Seafret dug deep enough in themselves for this track? Fortunately, ‘Bad Blood’, the third track of Seafret’s EP, makes up for what ‘Can’t Look Away’ lacks in depth. It’s here that we really hear Sedman’s talent for expressive vocals. Again, the duo has favoured subtlety to express emotion, with Sedman not overdoing it on the performance but rather letting the small breaks in his voice and slight dynamic fluctuations do the talking. It’s these small elements that shine on the track and make what is an electric, rock track more intimate and raw. These subtle elements are also successful in connecting ‘Bad Blood’ to final track ‘Heartless’. Although the two tracks are polar opposites in instrumentation, the clear emotion in ‘Bad Blood’ allows for a smooth flow to the fourth track, undoubtedly the most profound on the EP. ‘Heartless’ itself is acoustic heaven: simple yet seductive in its intimacy. It’s a perfect way to end the EP, showing Seafret at their most vulnerable and leaving the listener wanting more of this raw edge that we heard so brilliantly in three out of four tracks of this EP. ‘Monsters’ will be released this Friday, the 7th of September, on Kobalt. You can catch Seafret on their next English tour later this month, listed here on their official Web site. Our archive of articles on Seafret here on TGTF can be accessed this way.